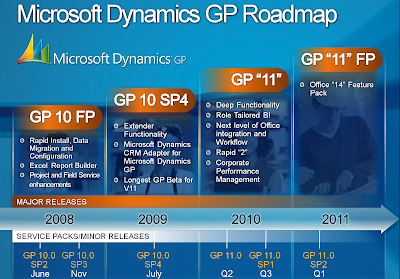 Description: For those of you who did not attend Convergence 2009 and have been asking about release dates of service packs and new versions of Dynamics GP, the following shows the anticipated product roadmap. Keep in mind that release dates and product features may change on a dime and by no means can be considered absolute Microsoft commitments. One things is very sure: Microsoft Dynamics GP 10.0 Service Pack 4 is just right around the corner and with it comes a revamped Extender product. For those of you wondering about the feature of the customization tools, David Musgrave has some reflections on that subject. Click here to read what he has to say. Plus I have the following to add: if you are a Microsoft Dexterity developer or a Visual Basic for Applications guy, Extender is still not the panacea for complex business requirements. Yes, you will be able to add new windows, yes you will have the ability to create transaction workflows. However, there is only so much Extender can do as it still operates within a set framework defined by its programming logic and that's where you come in as a developer.